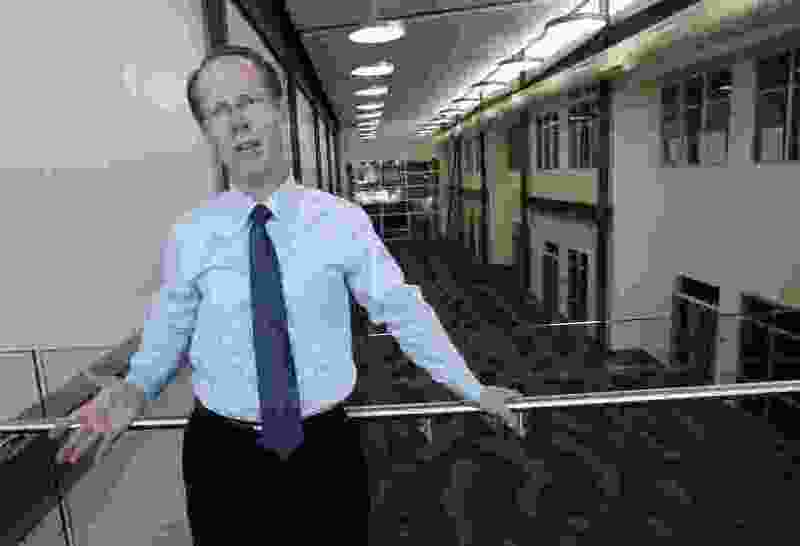 (Al Hartmann | Tribune file photo) Then-Principal Kenneth Grover shows the atrium area of the soon-to-open Innovations High School at 1700 S. State St. The school is next door to the Salt Lake Community College campus, where high school students can take advantage of the library and even some college classes. The following story was written and researched by The Utah Investigative Journalism Project in partnership with The Salt Lake Tribune. In 2015, Ken Grover, an administrator in the Salt Lake City School District, took the stage at the Salt Lake City TedX talk for his 15 minutes of education-themed inspiration. He didn’t exactly have a Tony Robbins stage presence — Grover looks and sounds the part of a school principal down to the neat, slicked-back hair and dry, monotone jokes — but his message resonated. He beckoned education leaders to follow the lead of his school, Innovations Early College High School — “a truly magical place” where the students are in charge. At Innovations, they come to class when they learn and progress on their own schedule. This revolutionary model, Grover explained, would result in positive academic outcomes such as graduation rates 15 to 20 points above the national average. Grover also touted the more than 1,000 visitors who came to witness Innovations firsthand. Innovations and its principal got lots of attention. Grover has spoken at education conferences across the country, and the acclaim helped him to get hired as a consultant on several projects, from Arkansas to as far away as China. But where supporters see magic, critics just see a not-so-cheap trick ending with a disappearing act. In 2016, then-Salt Lake City school board member Michael Clara sent a letter to the new superintendent for the school district, Alexa Cunningham, arguing that Grover seemed to be profiting privately as an education consultant, based on what Clara said were misrepresentations of Innovations’ success. Clara pointed to a Deseret News article that described the school’s 89 percent graduation rate in 2014 — double the rate (45 percent) recorded by the Utah State Board of Education. The inflated rate was repeated in an article in Education Next, a publication of Harvard’s Kennedy School of Government. It wasn’t the only discrepancy. In a March 2017 email to a reporter for an article about Innovations, Grover asserted to have graduated 100 percent of Innovations students in 2016. The state, however, showed the school had graduated 88 percent — slightly better than the statewide average. Grover, a Salt Lake City resident, did not respond to several requests to comment for this story, including the most recent request on Friday. There are other questions about the way the school was run. A review of public records shows unusual spending patterns at Innovations. The school poured significant funds into cutting-edge technology, everything from virtual reality headsets to Nintendo DS gaming systems, iPods and even expensive Beats by Dre brand headphones. Innovations also used public funds to shower students with gifts and sugary treats. In 2016, the school spent nearly $3,000 on snacks — gum, chips, doughnuts, soda, pies and ice cream. The school also purchased more than $2,000 in gift cards from outlets like McDonald’s, Starbucks and Amazon. And in April 2017 alone, the school bought $2,192 worth of prepaid Visa cards. Then, last December, in the middle of the school year, Grover resigned. His abrupt departure was shrouded in as many unanswered questions as was Innovations’ founding five years earlier. 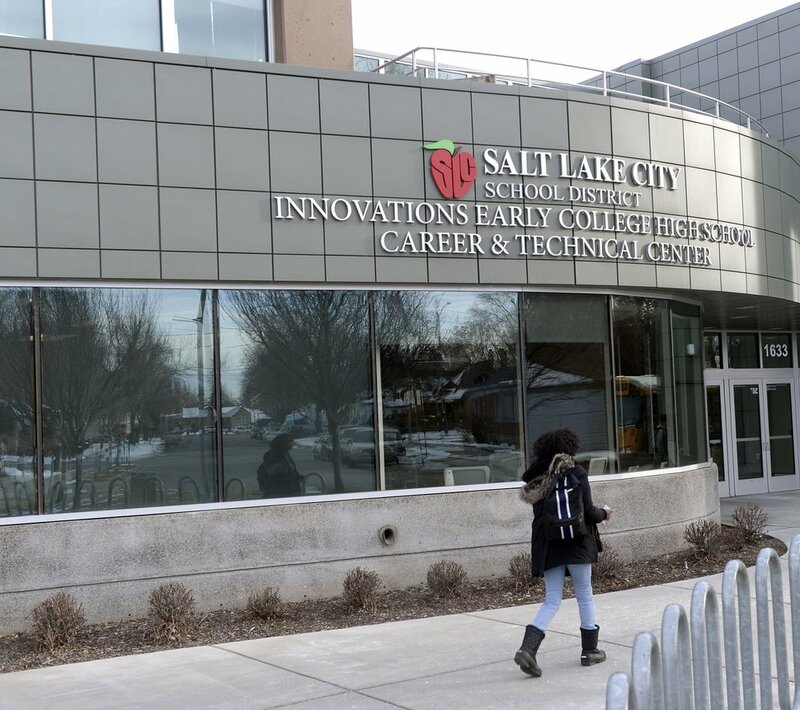 (Al Hartmann | The Salt Lake Tribune) Salt Lake City School District Innovations Early College High School in Salt Lake City. In the spring of 2012, the Salt Lake City school board was awaiting a tour of the new Career and Technical Education (CTE) Center built on the south end of Salt Lake Community College’s South City Campus. The two-story addition had been given the green light in previous meetings to provide more space to high school students interested in taking early college classes at SLCC. What board members didn’t realize at the time was that they had also helped build an entirely new high school, one that would share space with the CTE center addition. The board discovered this only when flyers announcing the opening of Innovations started showing up in their neighborhoods. At the board’s first meeting about the school, March 6, 2012, then-Superintendent McKell Withers defended the opaque genesis of Innovations and began the discussion by applauding Grover for his work at the Legislature that year on Senate Bill 178. Grover then proudly explained that the bill would tweak online high school courses to help keep funds for those students in the districts where they live. Despite having an entire high school almost whisked past them without their knowledge, board members were largely supportive — though also a little unsure as to what they were supporting. Over the next hour, Grover explained the school was all about technology, personalized learning and putting the students’ educational destiny in their own hands. He also promised Innovations would not poach students from other schools but would attract those who would otherwise be dropouts because they didn’t fit the traditional school mold. On top of that, Innovations seniors would have to take concurrent enrollment or CTE courses that they could access right there at the CTE center. Grover left the meeting unbruised and having had to make only a quick apology and promise that he would better communicate with the board next time. At Innovations, students show up when they want and use computers to run through their curriculum and get coaching with teachers. It’s a liberated environment where Grover has said at conferences that “bells are a thing of the past.” Students go where they need to and progress at their own pace. When they have a concept down, they can move on to something else or just go home. It appears, though, that they weren’t getting the concepts down. The Utah State Board of Education’s statistics show not only a poor graduation rate, but also that the school was below state and district proficiency rates in language arts, mathematics and sciences every year since 2014-15, the first year that complete data were available. By 2017 — the school’s strongest academic year — students were still at least 10 points behind the state average in these core subjects. In mathematics, Innovations was at 21 percent proficiency, compared with 47 percent for the state and 46 percent for the district. But even these below-average rankings are open to question for their accuracy because Innovations had an unusually high number of students who opted out of standardized tests. In 2017, 31 percent of tests at Innovations were not taken due to parental exclusion. In 2016, it was 27 percent of tests. West and Highland high schools had the next highest opt-out rates in the district at 3 percent for that time period. According to the state school grading system, Innovations was given an F for 2015 and 2016, and in 2017 rose to a D.
In one of Grover’s education conference talks, he joked about student-centered education meaning pizza for lunch every day, before stating that really it was about respecting students’ desire to learn in a flexible way. This flexibility was a key point of Grover’s marketing of the school — any school could do it, since no extra money was spent on Innovations. In reality, Grover’s school spared no expense on technology, touting its one-to-one pupil-to-computer ratio for a school of more than 400 students. Moreover, a review of expense records, especially credit-card receipts, showed spending that surprised board members and the school district. Between 2016 and 2017 the school charged $5,368 for sugary treats — everything from pies from Marie Callender’s to lots of candy from Walmart — and $5,077 for gift cards. The gift cards included numerous $50 cards for Amazon, but also smaller $5 cards for McDonald’s and the occasional $100 gift card to Steam, a site where individuals can download computer games. Salt Lake City school board member Rosemary Emery said teachers have a small supply fund they can draw from for pizza parties and small treats to be used as incentives for students. But she was surprised at how much was spent at Innovations, noting that those kinds of expenses don’t get shown to the board. The perks went beyond treats and gift cards. Innovations students went on a field trip to an escape room in September 2016, and the school also purchased some unusual learning materials. In December 2016, the school bought $205 worth of candy and treats, paid $14.99 for a copy of “The Sixth Sense” and $19.50 for a book about drug kingpin Pablo Escobar, bought a $100 Steam gift card and spent $399 on a GoPro camera and $643 on two Nintendo DS gaming consoles. Besides the game systems, Innovations invested a lot in high-tech equipment, from external hard drives to a virtual reality system that cost $799. District Superintendent Cunningham said while Innovations may have spent its money differently than other schools in the district, it did not receive extra funding. All the sugar, toys and gift cards wouldn’t trouble Clara, he said, if the program were successful. But he doesn’t see that as the case and views the questionable cash outlays as another symptom of the lack of transparency. Despite its mediocre-to-average academic outcomes, Innovations still was an object of curiosity that drew praise and visitors from across the country. One of the last acts of outgoing Superintendent Withers in the summer of 2016 was to buy three vans at a cost of $81,600 — vehicles that Clara said were used to help bring visitors to the school. Salt Lake City School District spokesperson Yandary Chatwin said the vans are still in use, but are primarily used for shuttling students, though she added she was unsure if the vans were also used for visitors. The material Grover sent to the reporter also listed him as “Principal Senior Consultant” for the Arkansas Department of Education’s Office of Innovation for Education. Records from the University of Arkansas show that Grover was paid $29,250 in consulting honorariums by the university between July 2015 and September 2017. On average, he was paid $1,500 each day he was in Arkansas, while also being reimbursed for all air travel, lodging, meals and car rentals for his trips. Salt Lake City School District employees, like most public employees in Utah, are required to disclose on conflict-of-interest forms payments they receive outside their public salary. Grover did not disclose any of his outside consulting arrangements, according to Chatwin, nor did he seek prior authorization for the work that might take away from, or conflict with, his administrative duties. Grover’s information provided to an out-of-state reporter showed that, besides his Arkansas presentations, he was a consultant or keynote speaker at 14 other events across the country since 2013, when Innovations opened. One foray was to China for a venture with a company called Wayne Education. According to a Chinese website describing the program in the spring of 2017, Chinese students in Suzhou would pay yearly tuition of 180,000 RMB (roughly $30,000 U.S.) for a high school program that would allow them to take their junior and senior years at a high school in the Salt Lake City School District. The pitch was that students getting a Western education and taking SATs in the states would have a leg up in getting into an Ivy League university. The program was first written by Grover himself in 2015, when he was then the director of all high schools in the Salt Lake City district and signed a memorandum of understanding with Wayne Education to provide a complete high school curriculum for Chinese students that, in digital format, would be specifically provided by Synapse Education Solutions. Grover was intimately familiar with Synapse; according to Utah corporation records, he owns and manages the company. State ethics law prohibits a public employee from participating in or profiting from any transaction between the employee’s government agency and a private business in which the employee has an interest unless the potential conflict has been disclosed. A May 2017 Chinese news article talks about this special overseas education program, lauding Grover who “has stirred up the reform in the American education sector,” for providing the kind of education Chinese students would need to succeed in the Ivy League. An April 2017 article from a Chinese site shows pictures of Grover as well as his twin brother, Rep. Keith Grover, R-Provo, and Robert Steele, a former Innovations administrator, on a stage taking questions from Chinese students. That article lists Kenneth as a general adviser and Keith as a consultant to the Bo Pei Creative College, where students would take their American-style high school curriculum before traveling to the United States. Unlike his brother, Keith Grover does list Wayne Education as a source of income on his legislative conflict disclosure form. Superintendent Cunningham said she first heard about any tie to Wayne Education when a company representative approached her last October. He said Wayne had 28 Chinese students who had been taking an English online curriculum. The company would pay the Salt Lake City School District $10,000 per student if they could come over this spring for test preparation and then start their senior year in the fall of 2018. Cunningham declined the offer, saying that was too short a turnaround and there were many logistics that would have to be worked out. “I didn’t know what we were getting into,” Cunningham said, adding she was surprised by the visit and that the representative acted as if he had already been working with the district. It was soon after that conversation, she said, when she looked deeper into the issue and discovered the agreement Grover had signed with Wayne Education. Cunningham said that the district at least did not pay any money to Grover’s company Synapse for its work developing the English online curriculum. Eric S. Peterson is the founder and a director of The Utah Investigative Journalism Project. He reported and wrote this article for the project in partnership with The Salt Lake Tribune.